I don’t like Dream Daddy. There. I said it. A game that de-eroticises queer romance in some apolitical neoliberal mystery world isn’t it, chief. * There’s a lot to love there, but so much about its technically-indie-corporate-sheen marketing gay romance rubs me the wrong way. I’m glad the game is there for those who need it, I’m glad there’s a game where queer folks seem pretty happy, but I’m not going to sing its praises from the rooftops just because the hype around a gay driven romance suggests that I should — and the only way for things to get better is for queer folks to keep making games about them. I guess you could say I’m grumpy. It should be pretty clear by now that I feel all sorts of ways about romance in games — not just in Dream Daddy. Let’s say that our relationship is… complicated. I want to have a complicated relationship with games! I think it is so so important to walk through life with a willingness and openness to have conversations about what does or doesn’t work for you and why. I believe that this is true of all healthy relationships. You aren’t going to always get along, your partner is going to make mistakes, and it’s good to know how to apologise. Now, before I begin with the games for This Week of Love: If you haven’t played Butterfly Soup or Heaven Will Be Mine (or We Know the Devil), or the prologue episode of Date Or Die! go do that. Did you read my piece about Christmas love stories? Give that a shot, too. Once you’ve gotten that out of your system, here are some games about relationships and love which really run the gamut. Dominic Tarason pointed to this game back in December, but I think it warrants a revisit in February. Lawhead is making some of the most inventive work in game design today, and if you haven’t explored her extensive blog and collection of playful softwares, I really recommend giving her work a dedicated bit of time. A Desktop Love Story is a sweet folderscape soap opera taking place across multiple file folders. 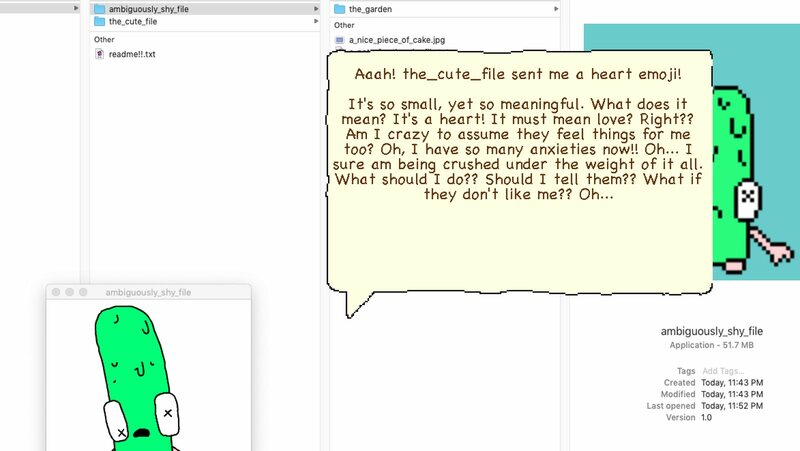 ambiguously_shy_file.exe has a crush on cute_file.exe, and needs your help to stage their meet-cute. “Due to system restrictions,” writes Lawhead. “This is a forbidden love. As System Administrator, you are the only one that can help them.” You pass notes, and have to try and read the situation between the two lovefolders (no one likes to be forced into meeting anyone before they’re ready, after all). If you’ve beaten the game, and want to see what went in to making it all work: take a look here. There is a very exciting realm of game development which focuses on queer experiences and communities, and how to utilise mechanics to showcase them. I regularly look to what designers Anna Anthropy, Avery Alder, and Porpentine are doing, and this column is a pretty good indicator of that. Ada Quinn is new to the list, but I think that her game for the Sad Mecha Jam is a good omen of things to come. I don’t know what it is about queer folx and (sad) mechs, but there is something happening there, and so I happily turn to the Sad Mecha Game Jam to inform my understanding of this brave new world of relationships. 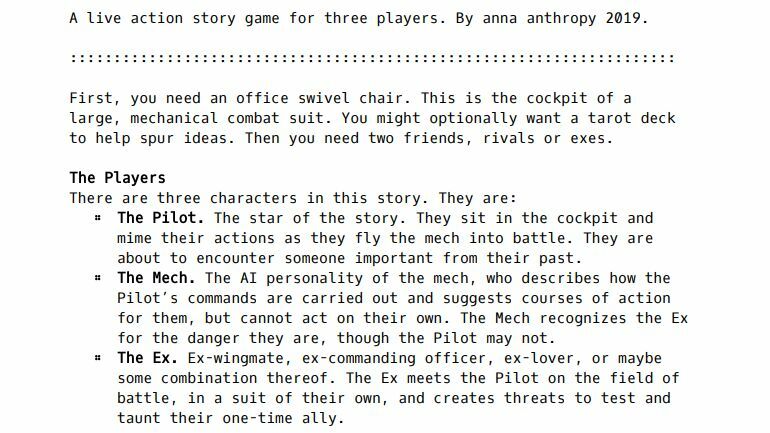 I must admit that while I have never dipped my toes into the wealth of sad mech media, these two analogue games from Anthropy and Quinn which consider the relationships it takes to make a mech army, are an enticing advertisement for the genre. It’s not all nuts and bolts; there are people in those mechsuits. BEFORE YOU PLAY THIS GAME YOU HAVE TO KNOW THAT IT WILL END BADLY FOR YOU. It’s no Doki Doki Literature Club, but the Date (almost) Anything Simulator is a dating sim that has a lot to say about wasting your time playing video games. I picked this game not only for its gameplay, which is sweet and fun, but for the swaths of passionate comments and debates on the comments of its itch page. 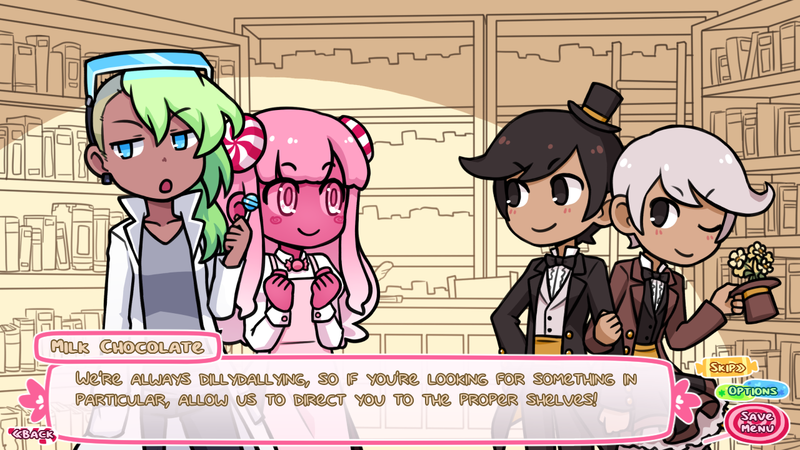 The Date (almost) Anything Simulator is a dating sim that’s (almost) downright antagonistic about the very act of playing it. There’s an understandable friction here: dating sims inherently play on our vulnerability. They’re games about love, after all. 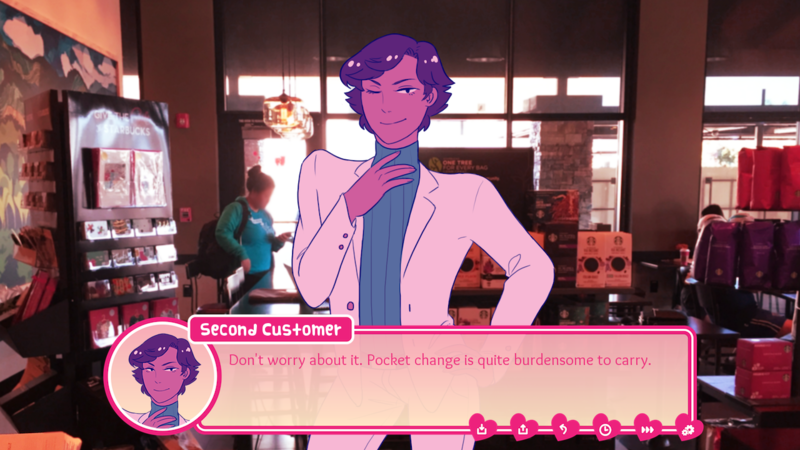 There are a lot of generative questions about what the transactional mechanics of dating sims do (see Kindness Coins, for example), and I think that the Date (almost) Anything Simulator is an interesting addition, even if the “the meta-game is the game” well might be running a little dry. Hey — it’s not all bad! *There’s a great conversation between Gita Jackson and Riley MacLeod over at Kotaku which covers a lot of my misgivings about the game, and I encourage you to read it! Just about anything I’d say about Dream Daddy is in their piece.